Penguins on the equator | Twende pamoja! OK, so the title of this post is a little misleading, I’ll be honest. Unfortunately, there are no penguins here in Kenya. Aside from some excellent metaphorical one’s which I’d like to celebrate. A little bit of context. When VSO start trying to prepare new volunteers for what life might be like working somewhere completely alien to them, they do a really excellent job through intensive residential and online courses. I genuinely loved these weekends with a bunch of lovely, equally excited and daunted, people from all walks of life. One of the first topics covered is culture shock. As someone pretty well-travelled and having lived abroad before, I was in some ways less concerned about this process. In fact part of the reason I was volunteering was to be a little shocked and jolted out of my rather comfortable comfort zone at home. But at the same time I knew, particularly in the work context, adapting to different ways of doing things could take its toll. The “iceberg model of culture” is beautifully depicted in the artist’s rendition above; the true subtly of the concept wonderfully captured in the juxtaposed elements of the composition. 4. Penguins = friendly locals who help out foreigners! 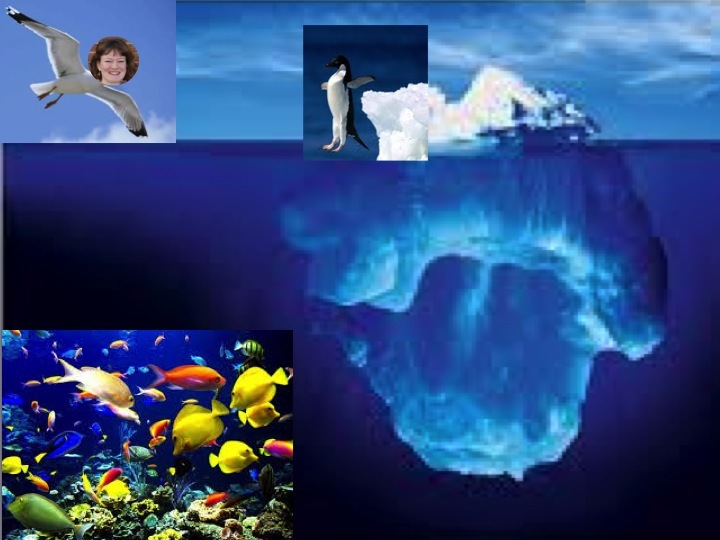 If the iceberg is culture then the metaphor holds that foreigners only see the tip of it. That bit poking up above the surface of the choppy waters. As we fly away from our homes and arrive in foreign lands, we immediately notice the obvious. We see things like art, music, religious and community rituals and ceremonies, dress, language, food and leisure choices. The visible manifestations of culture. What we don’t see so readily are the beliefs, the social norms and attitudes, the values, the web of complex interpersonal relationships, the history. These form the giant underside of the iceberg which the fish/ locals, swimming about during their daily lives, see so often they take it for granted that this is the way things are. So familiar are they with this icy landscape they sometimes they slip into thinking it is “normal”, universal, something all people have grown up with and “get”. In other words, the seagulls don’t know what they’re missing and the fish don’t totally realise the need or desire of the seagulls to experience and understand the same vista. And this is where penguins become far more than slightly comical birds in the lives of a VSO volunteer. Because we’re not just here for fun and holidays. Because we have to try and live our lives for a length of time and feel vaguely happy and supported. Because we have a job to do and expectations of employers to meet. We need to see that hidden iceberg belly so we don’t misunderstand, cause offence, get offended, and spend all our time in a mess of frustrated confusion. In summary, VSO’s advice to new volunteers upon arriving in your new home country is: FIND YOUR PENGUIN. What I found is that the penguins tend to find you. I was too busy trying to land on the iceberg to make any concerted effort in this regard! How to top up my electricity meter using my phone, how to find the bus station in town from my office, the prices of common bus journeys so I don’t get ripped off, the names of common bus stations so I know how to ask for where I want to go, how to make sure our programmes actually meet the needs of young people, how to deal with office politics, what it means to work hard and stick to your principles and how to make Mixed Tea. VSO placements, you’re told, are going to be hard. Progress will be slow with many steps backwards. Xaviers has pretty much been the main reason I’ve kept trying and kept working. Time and time again when I don’t know where to turn, she is there being totally unflappable and ready to work through the problems with me. I would have probably have spent eight months twiddling my thumbs if it hadn’t been for her but for some reason she kindly tells me I have helped her which makes me feel pretty good about life. My second penguin is Mildred, the HR Manager who sits in the office next door to me. As a social lynchpin, having Mildred take me under her wing meant instant access to a huge colony of penguins. Mildred’s main delight is in teaching me about the funny ways of Kenyans with a focus on: love and relationships, politics and religion. The Big Three cultural topics which I’ve found way more entertaining than The Big Five you find in the safari parks. From Mildred I also learned that, in contrast to the UK, tights are totally unacceptable office attire. This made me blush remembering the stash of new M&S tights I brought out with me knowing that office wear was more formal than back home. And which I wore every day in my first few weeks. When I mentioned this, Mildred gave a little smile and said “I didn’t say anything as I wanted you to notice what was going on around you yourself and make your own changes”. A true teacher. I love penguins. They are cute, have funny walks, and are a fun bunch to hang out with. They might even teach you how to do that walk if you spend enough time with them. Pingback: Time for a change | Twende pamoja!